This place has a neat little biergarten in back. You can tell you're walking back in time when you enter here. I like the fact that the owner has stayed true to the setup and décor.....yes, the tables and chairs are from the 70s but you have to put that aside to feel the true spirit of this place. 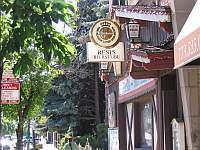 Resi's was a pioneer, being considered by many to have been among the first, if not the first, to serve Weiss beer in the U.S. My first experience was circa 1979-80 as a college student. Had never had a wheat beer and had barely heard of it. First visit, went in, sat down at the bar. Two or three old guy regulars sitting at the end of the bar, speaking German and drinking beer with lemon slices out of big glasses. I'll have what they're having. Long story short, after a few of those, some backslapping camaraderie, a jager schnitzel and complimentary shot of Flimm's apfel liqueur as a digestive, I was hooked. Thirty five years and 700 miles away now, I get to Chicago maybe once every 2-3 years. And I still make the pilgrimage out to W. Irving Park Rd. I wish I had a nickle for every afternoon I riled away in the stube. We even had a word for it back then amongst my friends, we called it "getting stube'ed". As in ,"lets go get stube'ed". I must have been 16 or 17 when I first started going to resis, it is after all, or was, old style German. I knew Carl the owner and his son, whom I hope still runs it. At one time it had the largest selection of beer of anywhere in the city. Resis had a big hand in educating the Chicago palate on what good beer was. Because it was a German Bier garten. A place one spent hours at with good company, where one can hear the other talk and there was never any trouble. I used to take dates there. And most of all there was the good simple food and the great beer. Before it became a yuppie hot spot it was the classic working man bier stube in a classic old German neighborhood in Chicago. Now Im going back to the '70s here. Then I came back from Military service and the Cubs crowd had started to find it but it was still a great place and I dont doubt it still is. I always thought the kassler ribs and Brats were the best dishes. They had a great sour kraut and rye bread too and a very good cold potato salad, all with a good mustard. On tap was always Pschoor and Dab tho I imagine they have all kinda stuff on tap now. Remember this place is classic German which means a German brew is a must. Even if it isnt on tap they have a bottle selection that will blow you away. Resis was a big part of my life at one time. I must go back one day, and do it soon. A medical condition made me give up drinking for many years but now Im allowed one or two and I'd love to go back. I hope its still in the family. I loved this place. I'll put this very simply. It's definitely German in the sense that it was made by and for a German immigrant community whenever it was founded. Bric-a-brac celebrating German beer and culture on the walls. It is by no means fancy and has a very working class feel and clientele. Good food though. The potato salad, wurst, sauerkraut, and potato pancakes are all worth a try. Often changing tap list includes a great German selection. The food is somewhat expensive, but the beer and liquor (a great selection of schnapps, brandies, and liqueurs) is not. If I lived closer, I would be a regular. Trying to tick all the top rated Chicago places, and this joint is somehow on the first page. Just around the corner from WLV we stopped here after a WLV tasting. A Friday night, we figured it would be busy, walked into a basically empty spot. The atmosphere is something I would like to call homey and nostalgic, but coms across as trashy and chessy. Very old inside, not much updating at all. Some generic German knick knacks, but its forced. Ugly old tables, stools are huge and clunky and make it difficult to sit at the bar....The service is severely lacking and outright weird. Sitting at the bar you have to order and pay from two different people, one for your beer, one for food. The server had a decent but fairly limited knowledge. Neither food nor beer service were attentive...The beers on tap were mostly German, a few things that are not common, but most was easy to find lagers. Bottle list of about 20 beers, more common beers, but mixed with quite a few bmc's...The food that everyone raves about was ok. Potato pancakes are pretty good but too thick and a tad plain. The schnitzel was big but plain. I got a brat but the bun was totally soaked. A plus was some really good sauerkraut....To me this is NOTHING like a real German bar. I would not venture here ever again. Went last night with a group of four total. No wait (on a Saturday in Chicago, impressive) to sit down at a table. If you order draft you'll get a .5L unless you specify (I think Liter is the only other option). The waitstaff was knowledgeable about the beers which is always appreciated. The atmosphere is low-class in a good way. It's not hipster low class, it's just actually. I picture this being a Royal Order of the Something guys' hang out after meetings. The beers are fresh and tasty. There were only two things on draft that I'd never heard of, and a handful of bottles that I didn't recognize. Potato pancakes are the straight dope here. Cool, relaxed, unpretentious place for a good time with old friends. Stopped in on a Saturday afternoon. Small and old looking on the inside. A bit dark, and worn but gives it a nice touch. Bartender greeted us immediately, and told us what was on tap. He told us to have a seat out in the beergarden if we wanted, and someone would take our order. The outside, althoug small was quite comfortable. Several trees provided shade, while there were a dozen or so tables with umbrellas. Very comfortable, although I couldn't believe there place was practically empty. Beers were German. Nothing outstanding, but some good solid choices. Julius Echter Heferweizen, Spaten Optimator, and BBK were the ones that stood out. All served in appropriate glassware, and tasted pretty nice. Our waitress was frinedly and attentive. We split some potato pancakes that were very good. Standard German fare on the menu. Prices were reasonable. Overall, a good stop. Love the beer garden. Old-fashioned German decor and 70's diner (seats, tables) make this an interesting stop in Chicago. BBK and others that aren't on tap at many places can always be found at Resis. In the past, I've noticed servers speak fluent German, as well as the kitchen staff. They've hired a more diverse set of employees on my 2008 visit though. No food on current visit, but in the past I found it to be traditional Bavarian, and worthwhile if you like the cuisine in general. Usually on my list for places to go when visiting Chicago. Small, intimate, and always a great German beer selection. A small piece of Munich dropped into Chicago's north side. The inside is chintzy but the beer garden is very comfortable, and reminded me a little of the backyard behind our apartment off Bryn Mawr when I was a kid. The beer garden is smallish, ~15 tables, seating for maybe 40. There were two large oak trees in the middle providing ample shade. I saw 8 taps, serving BBK Kutscher Alt, BBK Gold Export, Bitburger, Julius Echter weisse, Hacker Pschorr lager, Konig pilsner, Kostritzer schwarzbier, Spaten Optimator. The food tasted authentic and was sort of cheap, most things on the menu were &lt;$10. A very good stop for German beer and food. Resi's is really two different bars; the winter bar and the summer bar. In the spring and summer, the bier garten in the back of the bar is the best place in Chicago to go and have a few biers, talk, eat good Bavarian fare, and begin to think you were in Munich. In the winter, it is a smallish kitschy bar that before the smoking ban, was almost unbearable to be in late in the evening. Now, with the smoking ban, the bar is charming and allows me and my friends to enjoy the great bier selection year round. It does have one of the best Weizen selections I have seen this side of the Atlantic as well as a nice BBK, DAB, and many other bottles. Service: the bartenders are great and attentive. The waitresses can be a bit aloof and inattentive, but when asked, they respond well and take care of you. Food: Great food for the prices...don't tell my mom, but they have the best potato pancakes I have had! Overall, this is one of the my favorite places to go anytime of year, but especially in the summer. If you are coming to Chicago, make sure your stop by Resi's, you will not be disappointed. Oh, Lord. I curse you, Resi's, for letting me find you. Single-handedly responsible for my current German beer kick, Resi's is dangerously close to my workplace making it a more than tempting option after a grueling shift. Despite the subtle, pretty brick facade, the interior of Resi's is all kitsch. Think a combination of a VFW and your grandpa's basement/barroom. All sorts of nick-nacks adorn the back bar and the furniture is, shall we say, unpretentious. There is a beergarten in the back but I'm a drinker, nature be damned! There are 2 TV's and neither generally has the volume very high. Instead, one of the two barkeeps (both genuine, low-key dudes) will generally have their music on over the overhead speakers. Service is top-notch and very personalized although I've never been waited on outside of the bar (although a few of the waitresses are pretty darn cute...). I'm always offered samples of anything on tap, which is a huge plus. The selection, while not huge, offers a damned good cross-section of German beer (they lose a half point for no Berliner Weisse). On draft count on at least two of the seasonal (Oktoberfest, Hefe, Dopplebock, etc.) along with Kutcher Alt, BBK, Spaten and some other, funkier options. Bottled selection is strong as well with plenty of Avinitus, Ayinger and the like. The food, while predictably German (read: meaty and heavy) is of the highest quality. Any foodie I know would be impressed to find that all of the sausage served at Resi's is purchased fresh daily from Paulina Market. Resi's is my new favorite haunt. Resi's is one of the last remaining German biergardens in Chicago. Before my trip, I had read a review that stated that Resi's was like a German VFW hall. Can't agree more. The decor isn't much, but this place is still a find. If you like big, hearty Eastern European fare, as well as a wide selection of German brews, this is the place. I tried a BBK, which I had never heard of. The bartender described it as a German pils, although the beer itself was too sweet and not crisp enough to be a pils. BeerAdvocate lists a BBK Dortmunder, which might be the same beer I tried. Either way, it was pleasant enough, but not something I'd get again. I would, however, order the Aventinus I had as my second choice again. And again. And again. This beer was big and malty--very tasty. However, if I ever make it back to Resi's, it'll be tough to limit myself to just the beers I've had before. There were about 25 beers on the list, all authentically German or microbrews true to German styles. Very impressive beer list. And the food was terrific, too. I had Knackwurst, with kraut and German potato salad. Delicious. Made my German heritage proud! I've heard Resi's is even more spectacular when it's warm enough that you can sit out in the actual biergarden. That may be true, but I'd eagerly head back any time of the year. I walk in to down a few liters in preparation for the next days 2nd CTA Pub Crawl and I couldnt possibly be more pleased. This place looks like it was carefully pieced together in the sixties and then left untouched. Cute little orange tables line one wall. A simple bar lines the other. In the center of that bar are several huge German beer engines. A couple coolers in the corner boast an impressive selection of German bottles. Classic shtick is everywhere. The bartenders lamb chops greet me and shortly thereafter I am greeted by the bartender himself who kindly pours me a half liter of Jever, followed by another of BBK, and then a cute little ¼ liter of some other German pilsner Ive never heard of. Im amazed by the number of German beers here that Ive never seen anywhere else in America. I mean, the BBK only has one review on BA and this place seems to have a limitless supply of fresh barrels of it. Most of the taps are pilseners but Aventinus, Kostritzer, and Optimator smile proudly at me to round out the list. Prices were a touch high but so were the pours and the bartender threw in the last round on the house. What service! Solid rock was playing the whole time we were there. Propper glassware was used. I didnt try any food but I would like to. It looks like a fun place to eat. Ill definitely be back and am very excited that one of my best friends is living just down the block.